When it comes to casual boozing, Columbo was in a world of its own. In the 70s especially, the show was simply awash with booze. Every villain seemed to have a well-stocked bar within arm’s reach at any time – and they all seemed to make ruddy good use of them, too. So with alcohol an ever-present aspect of the show, and also a very enjoyable one, it got me thinking about which would be the stand-out alcohol-infused Columbo scenes. I even put the question out there on Twitter and Facebook to gauge audience reaction. And guess what? There are really too many to choose from! With that I mind, I simply put forward here 10 great booze-fuelled Columbo moments as a conversation starter as much as anything else. I’ve tried to limit myself to 1 scene per episode (except in the case of Any Old Port in a Storm, which could have had 10 all to itself). If you’ve read my review of Dagger of the Mind, you’ll be aware that I’m not a big fan of this episode, nor the outrageous hamminess of the performances by Richard Basehart and Honor Blackman as guilty parties Nick Frame and Lily Stanhope. That notwithstanding, the scene where the happy couple toast their own success in bed over rave newspaper reviews and Champagne is really quite something. This is self-absorbed, self-congratulatory 70s boozing at its best, and the most believable action either of them are involved in throughout the whole episode. Milo Janus is a cocky fella. I guess that’s what good looks, a chiselled physique, a hot young lover and many years’ worth of of ill-gotten gains will do for a guy. He’s also a complete bast*rd, as evidenced not only by him bumping off Gene Stafford, but also by him trying to make a move on Stafford’s grieving widow, Ruth, in a crowded restaurant. It’s cheers all round when Ruth marches out, delivering at least a modicum of comeuppance to Milo in the form of a full glass of wine to the face. The satisfaction is short-lived, however, as Ruth’s subsequent attempt to take her own life with booze and pills puts Milo’s few moments of humiliation in perspective. A dark and brooding tale of police corruption, cover-up and murder, A Friend In Deed is an episode apart in many ways – and is an entirely successful addition to the series. Its greatest triumph is the portrayal of central antagonist, Police Commissioner Mark Halperin, who’s introduction to the viewer is simply perfect. When we first meet Halperin he’s cavorting with a scarlet-clad woman while gambling and drinking in a vice den. There’s something of the devil in his looks and actions. Given that we know Columbo represents all that is good about policing, this introduction sets the stall out early that Commissioner Halperin is a man we can neither like nor trust. And so it proves in riveting fashion. I’m pretty certain Columbo was thinking the above line when he trundled out to Hipsterville to deliver the sad news of Ric Carsini’s death to his thick-haired fiancée, Joan. The place is simply overflowing with tanked up young coolios in minuscule swimsuits. Indeed, the Lieutenant has to wade through a veritable sea of them to get to Joan and Co. on the far side, negotiating a number of couples whose Dutch courage results in some proper rocking out to the sweet tunes being pumped out. It’s an outrageous spectacle and a magnificent snapshot of the vacuity and hedonism of spoilt rich kid life in the early 70s. I can’t find a video version of this scene online, so if you know of one and could point me towards it I’d be most grateful. Darlene’s Bar & Grill looks like the sort of dive that only hard-up students and hicks would choose to spend quality time, so it’s an interesting backdrop for Columbo to start formulating his case in 1990’s superior ‘new’ outing, Columbo Goes to College. 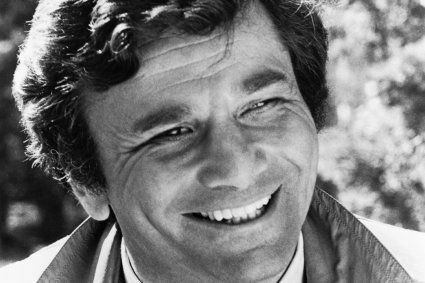 After investigating the crime scene at the university campus, Columbo heads over to Darlene’s to catch up with the criminology students he had earlier been lecturing. As well as getting some useful insight into dead Professor D.E. Rusk’s philandering ways and non-compromising mindset, Columbo also has his first suspect when Justin’s surname ‘Roe’ is dropped into the conversation. With Columbo knowing the Rusk-Meister (which no one says in the episode – shame) had nipped out of class to meet a ‘Mr Roe’ for dinner, he’s now got a reason to cling onto Justin and Coop until they inevitably give the game away – which they do, in fine style. And we owe it all to Darlene’s Bar & Grill! Who knew…? The pub darts scene, culminating in the rib-tickling live ‘limerick-off’, raises more smiles in the same episode, but as a means of signing off Columbo – seemingly forever – the final exchange between mercurial Oirishman Joe Devlin and the doughty Lieutenant is absolutely spot on. As the final line of the final episode of what looked to be Columbo‘s final series, this gave a sense of finality that seemed entirely fitting and wasn’t heavy-handedly delivered. It would be 11 years before the Lieutenant reappeared on screen in 1989’s Columbo Goes to the Guillotine. I’ve raved about how good this scene is before, but it’s worth reiterating that in Columbo’s very first outing, he locked horns with his opponent in a hypothetical manner that was oft repeated but never bettered. The antagonism between Columbo and French foodie Paul Gerard gives this episode a delicious edge, and it all culminates in a memorable closing set piece over scallopini and vin rouge as the Lieutenant draws out the killer. Gerard, you see, has poisoned the wine that he’s poured for Columbo using the same technique he employed earlier in the episode to bump off raging Italian Vittorio. Columbo’s one step ahead though, and switches the wine glasses to leave the poisoned one in front of Gerard, as he swigs deeply from the safe glass. Boy, wasn’t Dale Kingston absolutely ON FIRE at the Sam Franklin art exhibition in Suitable for Framing? Making the most of the free Champagne on offer, Dale milks the occasion for everything its worth as he establishes his alibi in unforgettable fashion. If turning up in a crushed velvet tuxedo wasn’t enough, our Dale has the art-loving cronies yelling with laughter at his highbrow ‘gags’ about art as he slops back glass after glass of the good stuff. And if the audience stops laughing then so what? Dale is more than capable of guffawing uproariously at his own jokes – as he amply proves. A tour de force of a scene, this is 70s’ entertainment at its very best and I could’ve easily handled a whole episode of this televisual GOLD! No article on booze-fuelled Columbo antics would be complete without paying due respect to one of the series’ most iconic moments: the LIQUID FILTH scene. It may not actually be as good a scene as the touching finale over dessert wine in Columbo’s car (which I rate as the episode’s single best moment here), but its popularity with fans never wanes thanks to Donald Pleasence’s phenomenal delivery. I dare say that no other actor in history could have done as much with that line as Pleasence did. Publish or Perish doesn’t usually get the attention it deserves, overshadowed as it is by the iconic nature of Murder by the Book and the crowd-pleasing magical backdrop of Now You See Him. I actually think Publish is the best of Jack Cassidy’s three Columbo outings, helped in no small measure by his truly phenomenal turn as wicked publisher Riley Greenleaf. You and I both know that any time Jack is on-screen is worthy of celebration. But he ups it several notches in the early scenes of Publish, where his shambling faux drunk antics as he establishes his alibi are gifts that keeps on giving. All the fun and mischief that we associate with Jack himself is embodied here in Riley Greenleaf. Every second of Jack in action, from the moment he walks into the book launch to when he challenges the cops to remove him from his illegally parked car, is SO GOOD! Perhaps the absolute highlight is his berating the couple in the car park of the dive bar in the valley (“Madame, in your condition I’d call a plastic surgeon,”), but it’s all astonishingly enjoyable stuff. Watching the evident pleasure Jack gained from delivering this performance makes it so sad that his own life ended just three years later in a fire at his penthouse, brought about by him falling asleep drunk with a lit cigarette. So there we have it: some of the best, most enjoyable ale-swilling Columbo scenes ever committed to celluloid. Please let me know what you think in the comments section below. There’ll be a bottle of Full’s Irish Dew sent out to whoever leaves the funniest comment. Until next time – bottoms up! Tags: Adrian Carsini, Any Old Port in a Storm, Columbo Goes to College, Dagger of the Mind, Dale Kingston, Exercise in Fatality, Friend in Deed, Joan Stacey, Joe Devlin, Justin and Coop, Lieutenant Columbo, Lillian Stanhope, Mark Halperin, Milo Janus, Murder Under Glass, Nicholas Frame, Paul Gerard, Prescription: Murder, Publish or Perish, Ray Flemming, Riley Greenleaf, Suitable for Framing, The Conspirators. Bookmark the permalink. It has often struck me how tipsy wives were often a feature of Columbo: Vicky Hayward in ‘Candidate for Crime’ has quite a fondness for the bottle; Ruth Stafford in ‘Exercise in Fatality’ drinks because of her frustration in dealing with Milo Janus; Frances Galesko in ‘Negative Reaction’ seems fairly squiffy by lunchtime, and Joanna Clay in ‘Last Salute to the Commodore’ is an unashamed drunk. Just an observation. Totally agree with you on this one. I really thought Joanna Clay would make the list! I love “THE GREAT RILEY FRANKLIN”–that’s wonderful. I’m a huge Jack Cassidy fan. Great list, as usual. Another honorable mention would be from “Make Me A Perfect Murder” and a completely trashed Valarie Kirk on the day of her live show, forcing Kay Freestone to air “The Professional” instead. I personally wish Ruth Stanford would have smashed that bottle over that SOB Janus’ head but what she did was the next best thing I suppose. Oh yes, I’d forgotten about that scene from Perfect Murder! She had lipstick all over her face and was a complete shambles, wasn’t she? I can’t remembered if she’s off her face on booze or pills, though. Yes, that is also a very nice one. Also in same episode when Columbo ‘invites’ himself into Ken’s house and swigs a bourbon as they chat and he spies that Ken has opened his mail. Yes–Ken and Lilly’s dialogue “Dare we? !” “Dare we not!” “Happy New Year!” is a personal favorite great boozy moment. My friend and I always say it when popping the top on any beverage. One little thing: The woman’s name is Honor Blackman.